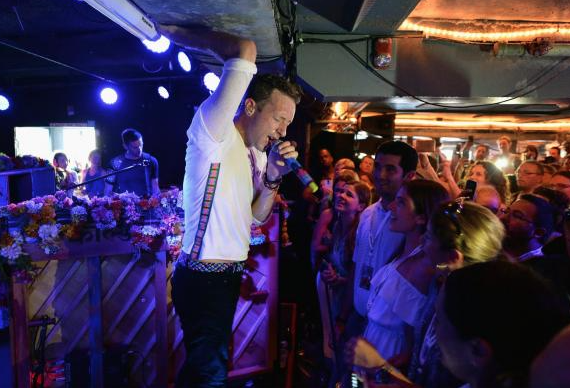 On a break from their worldwide “Head Full of Dreams” tour, Coldplay performed at the Stephen Talkhouse in Amagansett on Sunday night in a “secret” concert sponsored by Sirius XM satellite radio. Signs of a big event were apparent on Amagansett’s Main Street many hours before the 6 p.m. show, when town police and fire marshals cordoned off areas for fans to wait and positioned themselves in front of the Talkhouse. Crowds swelled along the sidewalk and traffic along Montauk Highway was stopped intermittently by police to allow concertgoers and onlookers to cross. The band, using Jack’s Stir Brew coffee shop across the street from the Talkhouse as its V.I.P. lounge, was ushered across the street in front of stopped traffic and along a corridor to get onto and off the stage. Sirius subscribers had entered a contest to win tickets to a show at an undisclosed New York location, along with transportation and lodging. The venue was not announced before the selection of concert ticket winners, but a poster issued by Sirius depicted the Coldplay musicians in front of the Montauk Lighthouse. Chris Martin, the band’s lead singer, shared a house in Amgansett with his former wife, Gwyneth Paltrow, and still visits the area. The Talkhouse has hosted numerous high-profile musicians over the years, but is just a fraction of the size of the arenas and stadiums at which Coldplay usually performs. Recent stops on the band’s tour included the MetLife Stadium at the Meadowlands in New Jersey last month, as well as overseas dates in Munich, Copenhagen, London, and Amsterdam. Among the guests in the audience of about 200 inside the Talkhouse on Sunday, besides ticket-winners, were Jimmy Buffett, John McEnroe, Christie Brinkley, Chad Smith, and Jon Bon Jovi. Beyonce and Jay-Z, with their daughter, Blue Ivy, who had reportedly spent Friday night with President Obama celebrating his birthday, pulled up in a large black S.U.V. and were ushered in the Talkhouse back door. They spent only a few minutes inside before leaving. In addition to those who viewed the show stageside, a number of guests watched the performance on a live feed on several TVs set up on the Talkhouse’s back deck. The show aired live and will be rebroadcast several times over the next week on Sirius channels.